Kids are naturally curious, and a great way to encourage that curiosity is by having them help in the kitchen. After all, cooking is really just another name for science! Choosing a recipe, gathering the ingredients, mixing it all up and waiting to see how it turns out- that’s the scientific process right there. It’s also a great way to encourage their creativity- they can help make faces on pancakes using fruit or arrange the food on a plate into an eye-catching design. I absolutely love having my little helpers in the kitchen with me! We have made so many memories there– baking holiday cookies and preparing daily meals. They love to help measure ingredients and use the appliances (with supervision, of course!). Getting kids involved in the kitchen is a great way to kick-start lifelong healthy eating habits and encourage a positive relationship with food. The kitchen is the place to show them healthy ways to prepare food. It’s also a great way for them to gain an understanding of where their food comes from. Little ones are also natural helpers. They want to be useful, and allowing kids to help in the kitchen will nurture their sense of pride and accomplishment. One way to engage kids in the kitchen is by finding a fun and kid-friendly cookbook with recipes and pictures that will interest them. Pinterest is also a wonderful resource because most of the articles have pictures! 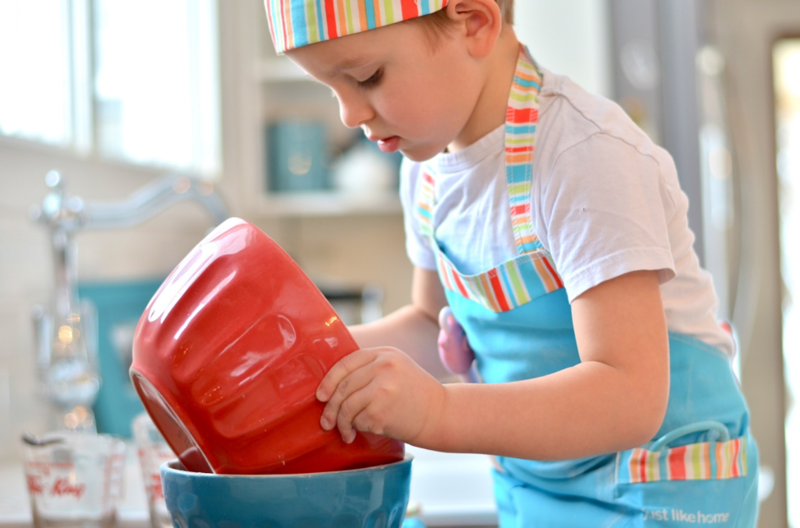 Children tend to be visual learners and seeing a picture of the food can help entice them into the cooking process. And we all know that kids who are given choices on what to eat are much more likely to actually eat! They want to feel valued and important, and having an input in the menu does just that. There are many cookbooks out there written just for kids. Barnes and Noble’s blog featured their top 10 cookbooks for kids here. New York Magazine recently compiled a list of the best cookbooks for kids according to chefs who are also parents! This list features cookbooks on pizza, Italian dishes, pancakes and even a cookbook based on the beloved Harry Potter series! You can find the entire article here. Why not take a trip to the local bookstore and pick out a cookbook together? It just might be the beginning of a mutual hobby for you and your child.